You can read three new studies from three Portuguese handball experts. 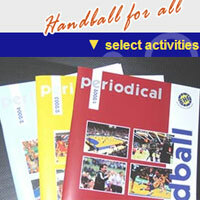 The Activities website of the European Handball Federation is offering a regular update of handball articles, studies and other publications. On activities.eurohandball.com, EHF lecturers, coaches and handball experts share their knowledge and experiences with all those who are interested in knowing more about a number of technical areas inside handball. The goal of the study was to evaluate the performance of 12-13-year old boys with different teaching methodologies. The main purpose of sports psychology is to identify the effects of human behaviour psychological factors in sportive context and consequently psychological effects in sportive participation (Cruz, 1996). This study belongs to the research area of sports psychology, more specifically to the domain of Performance Psychological Profile (PPP). Goal setting as a motivational strategy in the sportive context.